(a) Place the front seat assembly in the cabin. (b) Connect each connector under the front seat assembly. 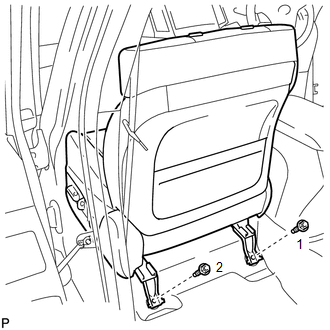 (d) Temporarily install the front seat assembly with the 4 bolts. 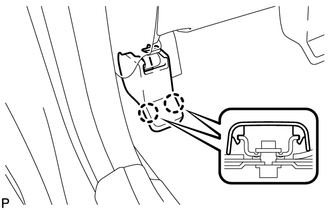 (e) Operate the slide and vertical power seat switch knob and move the seat to the rearmost position. (f) Tighten the 2 bolts on the front side of the front seat assembly. Tighten the bolts in the order shown in the illustration. (g) Operate the slide and vertical power seat switch knob and move the front seat assembly to the foremost position. (h) Tighten the 2 bolts on the rear side of the front seat assembly. 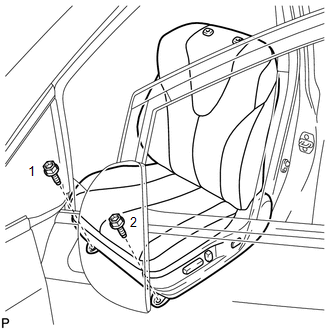 (a) Engage the 2 claws to install the front seat rear inner track cover. 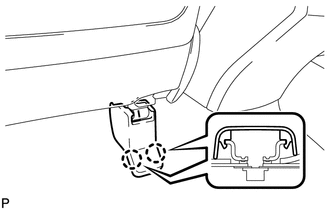 (a) Engage the 2 claws to install the front seat rear outer track cover. (a) Inspect the power seat operation. Check the seat heater operation. (2) Turn the seat heater switch on. (3) Wait 5 minutes or more and confirm that the seat surface becomes warm.